New course layout looks nice. I like the look of the new course screens that was just implemented. It works much better on my wife's dippy laptop screen than the old layout, which required scrolling. I don't know if I'm in a beta group or not. Do others see it yet? Anyway, good job, guys! It must be a new implementation on beta, i seem to have the old screens. What is different with the new one? The old format, which I still have, lists words to be studied in a little box under each lesson number, for "locked" and "unlocked" lessons. Has that disappeared? Maybe they show up w/ mouse-over help? With the new design, if a lesson is locked, its vocabulary is not exposed at all. Aha. Thanks for the reply! Hm, I have the new layout in my Italian course, but not the Tips and Notes. Is that only for German? They should be available for any language that has them. Not all skills in a given language has them, though. Would that apply to the current beta courses as well? It appears that way. I see "Tips & Notes" buttons for the Danish, Dutch and Irish courses for English speakers. If you haven't finished a skill, you cannot see the lessons that you haven't done (see the words and study yourself), unless you highlight the page and copy and paste that elsewhere (I believe that was what pinkodoug did). Otherwise, it's the same, just a different layout. I do like, though. Cut & Paste only works to grab lessons that you've completed - it just lets you get everything at once rather than having to page through the lessons. If the lessons are still locked, the words aren't available. Can you give us a picture? There are already 2 pictures... I don't really know what your seeing but they're very noticeable. His was the first or second reply to the topic. At the time, neither OldSpiceGuy nor I had posted pictures. Makes sense. Thanks for clearing that up. I wonder how long it will take for me to get the new layout. I really like it, too! I hope they decide to leave this one. It's so much more friendly. I hate it. It's certainly pretty visually, but it significantly reduces usability and irks me in Dutch: the redesign of notes dropped colors, and if there's bold there, I cannot see it. The amount of text is way too small, enough to read at a glance, and to consult previous parts of text and compare I need to scroll up and down and up and down. Urgh. To see the lists of words in a skill I now need to click (sometimes 10 or more times), and click again if I want to compare. Seeing the words in a skill I haven't completed used to help me to know if there was new material I needed to study lesson by lesson, or I knew it and could test it out. They also removed my "Word" tab at the same time, while I was in the middle of compiling and editing a word list at Memrise, leaving me with the same set of repeating sentences and turning what used to be effortless into grinding. 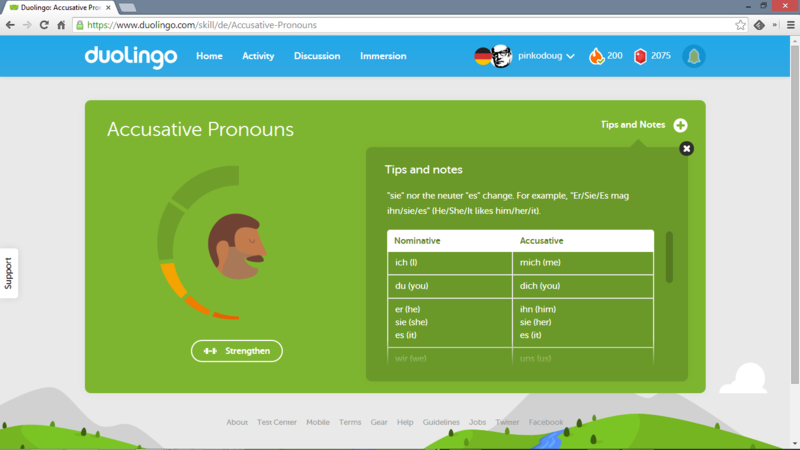 There is literally no place for me in whole of Duolingo to get an overview anymore. I'd rather the design was plain and ugly but usable, than have it look lovely, but downgrading usability drastically.